(AINA) -- An Egyptian court issued a controversial ruling on Saturday, May 29, which deprived the head of the Egyptian Coptic Orthodox Church of the control over matters of divorce and marriage, giving the civil courts the authority to oversee affairs which the Church considers are in its core religious competencies. 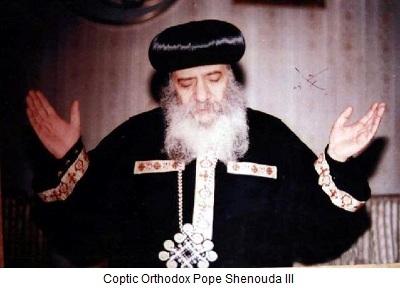 The Supreme Administrative Court's ruling compels HH Pope Shenouda III, Pope of the Coptic Orthodox Church, to give a license for marriage for the second time to a divorced Coptic man, rejecting Pope Shenouda's appeal and upholding the ruling by a lower court. The Supreme Administrative Court, headed by Justice Mohammed Husseini, based its ruling on the "right to family formation is a constitutional right, which is above all other considerations." It went on to say that although the court respects religious feelings, it has to govern in accordance with the law. The provision of the Supreme Administrative Court is final and no further appeals are possible. The verdict comes on the heels a lawsuit filed by Hani Wasfi Naguib against Coptic Pope Shenouda, challenging the grounds on which the Church refused to grant him a license to marry again after his divorce from his first wife. An Administrative Court (first instance) had previously issued in 2009 a ruling in favor of the plaintiff Naguib, ruling that he was entitled to receive the Church's license, but the Pope lodged an appeal against it before the Supreme Administrative Court. At that time, Pope Shenouda said that the ruling of the administrative court to oblige the Egyptian church to issue a license for a divorced man is non-binding. He added: "We are only bound by the teachings of the Holy Bible. We cannot go against our conscience and comply with a court ruling which is a civilian ruling and not ecclesiastical." In response to today's ruling, Bishop Armiya, Secretary to Pope Shenouda, issued a statement stressing the respect of the Coptic Orthodox Church for the Egyptian judiciary and its rulings, but saying "there is no force on earth that can force the Church to violate the teachings of the Bible and Church laws, based on "What God has joined together let no man separate." He added that Islamic law allows the Copts to resort to their own laws, and the state respects the freedom of religion. Bishop Armiya said that during the coming period the Church plans to take legal action to revoke the ruling, at the same time it will not allow a second marriage for anyone, whoever he may be. The ruling of the Supreme Administrative has angered Copts and several senior Coptic lawyers, who viewed the resolution as not serious and in violates the Constitution. Article VI of the Act 462 of 1955 confirms that the judicial rules in matters of personal status for non-Muslims has to be in accordance with their law. Lawyers view this Court provision "as contrary to our Christian religion." Attoney Nabil Gabriel believes that the Court must not interfere with the privacy of the church and its religious rituals. "Can the Court oblige the Al-Azhar Grand Imam to make prayers 6 times a day instead of 5? Why does the Court intervene in religious rituals of the Copts which stem from the Bible." Gabriel explained that the Pope cannot follow provisions of the judiciary that are not consistent with Christian teachings. He anticipates that the provision will lead to a crisis with the Copts and clashes with the Church. He asked church officials to resort to the Constitutional Court to stop the ruling and block its implementation, because it opens the door for people who want to marry again, disregarding religious teachings. Coptic lawyer and activist Mamdooh Ramzi said Pope Shenouda does not need to comply with this ruling, as he is not a public servant. "Article 123 of the Penal Code does not apply to Pope Shenouda III for failing to implement this provision, because the text is clear: Each public employee who refrains from enforcing a judicial ruling would be imprisoned." Commenting on the ruling, Dr. Naguib Gobraeel, President of the Egyptian Union of Human Rights and legal adviser to the Coptic Church, said "the ruling is non-binding, because a license to marry lies within the core jurisdiction of the religious authority based on the Bible. There is no control or supervision on this purely religious aspect by any authority." He went on to explain that a church marriage, which is one of the seven Sacraments of the Church is not like a civil marriage, which can be dissolved by any party if the second party breached his/her obligations." Gobraeel also said that this ruling has erred in the application of the law, as it is not permissible for the President of the Supreme Administrative Court, Counselor Mohammad Husseini, to look into this case, as he had already ruled on this case once before when he was head of the administrative court. Gobraeel said he is going to appeal the ruling to the Board meeting of the Administrative Tribunal. "Church is for marriage and courts for divorce," says Coptic lawyer Mamdouh Nakhla, who is also director of the Al-Kalema Center for human rights. He commented that the ruling is not binding to the church, which has a special marriage ritual which is different from other marriages and should be respected by the judiciary. Nakhla is determined to fight this ruling and prevent its implementation "because it is detrimental to our Christian faith and interferes in its core principles."